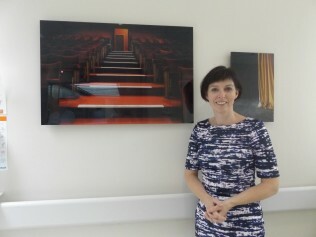 Healthcare manager Bernie Austin reflects on the unexpected benefits of a collaborative approach to commissioning artworks within a community nursing unit. As the Director of Nursing of a HSE community nursing unit for older people, I believe that residents should be able to live their lives to the full with opportunities for personal development and enrichment through connections to the wider community. I have witnessed older people in residential care embrace new experiences and become invigorated by these interactions. Involving the arts and, in particular, an interactive approach to the arts is central to this. Therefore I was delighted to have the opportunity to access the Per Cent for Art Scheme with the help of HSE Estates and Galway County Council Arts Office whereby four artists were commissioned to creatively engage with the residents of St. Brendan’s Community Nursing Unit in Loughrea, County Galway, leading to the production of collaborative artworks. The Per Cent for Art Scheme is a government initiative, first introduced in 1978, whereby a percentage of the cost of any publicly funded capital, infrastructural and building development can be allocated to the commissioning of a work of art. Since 1997 this scheme has been made available to all capital projects across all government departments. St Brendan’s Community Nursing Unit accessed this funding on completion of a purpose built residential care facility for Older People in 2011 and the artists were selected through a competitive process by a committee comprising representatives from HSE staff, HSE Estates and the local arts community. I viewed the Per Cent for Art funding as a much valued house warming present. As healthcare managers, we are always conscious of value for money and stretching scarce resources. This was therefore considered as an opportunity to have some fun while simultaneously meeting the often untapped area of involving the arts in a care environment. I was even more enthused to discover that there is a great degree of flexibility in the scheme which allowed us to tailor the programme to meet our needs. While this is an arts project and the artistic outcome is key, the process was far more important to us than the end product. We decided on four projects across a span of artforms – music, writing and visual arts. We chose artists as much for their interpersonal skills and the collaborative and interactive elements of their work as for the end piece; indeed the finished products were often quite different from the initial proposal as the collaboration between artist and residents evolved. While the end product of each piece surpassed our expectations, the real value for us was in the interactions that took place between the artist and the residents and the relationships that developed from these. One such bond was formed between artist Eileen Gibbons and one of our residents Larry; their connection was not surprising as Larry was a keen amateur writer and Eileen’s artistic proposal entailed the written word and storytelling. With Eileen’s encouragement and guidance, one of Larry’s stories was published in the renowned Ireland’s Own magazine. Larry described this experience as ‘better than winning the lottery’. This brought a real sense of joy and pride to the unit as everyone celebrated Larry’s achievement with him. The freedom of the approach extended to timeframes for the realisation of the projects. While the projects were commissioned together at the outset, their delivery spanned the year. It was so refreshing to be involved in a project with no deadlines to be met or targets to be achieved. With the artists visiting the unit at varying intervals throughout the year there was always something new to look forward to. There was also a real sense of fun generated throughout the project. Most instrumental in the fun department was the music project by Tommy Hayes. We still have requests to get Tommy back for a session. Ceara Conway’s 15 Miles was the final project to be completed and one which leaves a real visual impact in the unit. The photos adorning the walls of the unit are a constant conversation starter. It is often visitors who recognise the various places and the topic invariably wanders from that place and times gone by to where we are now. Another lasting impression was left by Marielle Mac Leman’s wallpaper which is strategically placed to create a number of tranquil spaces in the unit where residents can rest awhile and enjoy a quiet moment. In a health care environment we are constantly reminded that resources are scarce and gaining access to funds to support arts is not always given enough credit. The value of having access to the Per Cent for Arts funding and the freedom to tailor make an arts programme to meet our specific needs cannot be underestimated. The four individual projects went some way to satisfying the varying interests of our residents. The fluidity of our approach enabled projects to evolve and ultimately, the interaction between the resident and the artist provided the inspiration for the end product. This would have been a lost opportunity had we commissioned a piece of art created exclusively in a studio. All of our art tells a story and has connections to the unit and to those who work and live here. The stories and music are replayed from time to time, the wallpaper and photos enhance the environment and continue to stimulate conversation. As future public building projects are in the making, I am often asked to comment on our experience. I always advise not to forget to access the Per Cent for Arts funding. This is a unique opportunity to bring the world of the arts into the care environment and a chance to have some fun with a project. The benefits to the residents are not easily measured but are very real nonetheless. Bernie Austin is a Director of Nursing with responsibility for three community nursing units in the west of Ireland . She has worked with older people in residential services for over ten years and holds a Masters in Health Management. This would have been a lost opportunity had we commissioned a piece of art created exclusively in a studio.